The biggest risk is that Tunisia’s politicians consider the past constitution-making as a painful, one-off exercise in negotiation and compromise, imposed by voting rule technicalities, rather than taking pride in setting a precedent for the country’s democratic culture and the region. After high hopes following the revolution in 2011, many Tunisians became disappointed with the slow pace of reforms and the seemingly endless political struggles that followed the overthrow of the dictatorial Ben-Ali. They wondered if the country was going anywhere. Amidst the frustration, the recent adoption of a new constitution offers a beacon of hope not only in Tunisia, but across a region that has seen little good news lately. In agreeing the constitution, Tunisians have shown that meaningful political negotiations and agreement between widely diverse positions is possible. 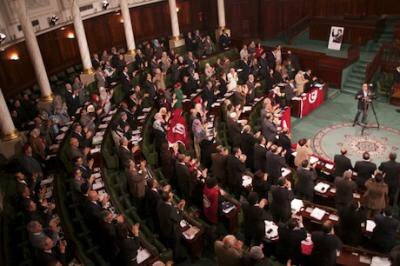 Deputies support ratification of new constitution for Tunisia, January 26, 2014. Demotix/Mohamed Krit. All rights reserved. In many ways, the process through which the constitution was worked out is as important as the result. It was slow, but the time it took was not unusual for a major political transformation. The challenge now is to implement what is, by necessity, a compromise document and defend the middle ground of moderation in the face of an ever-more polarised political class. We have been engaged in constitution making in Tunisia since the process began in November 2011. Early on, the members of the assembly wisely decided to require a two-thirds majority for final approval, rather than adopting the constitution by simple majority as some suggested. The effect was that no single party or political bloc could hope to unilaterally impose a constitution on the country as happened in Egypt. Everybody knew that they would have to find a compromise that would be acceptable to a large part of the assembly. The simple voting rule gave the negotiations a dynamic toward the political center. The rule did not make life easy. Everything had to be agreeable to a large part of the political spectrum and the process took more than two years, rather than one as originally planned. The compromise has resulted in some ambiguous articles, most notably those dealing with the state and religion - the question that so polarises the whole region. Article 1 says that Islam is the religion of Tunisia, while article 2 indicates that Tunisia is a ‘civil state’, which is generally understood to mean neutrality towards religion. In contrast to Egypt’s new constitution - written under military tutelage – the Tunisian text has no reference to Sharia law. In supporting the making of this constitution, we sometimes found ourselves in an uncomfortable position. Being committed to the international human rights system, we were in favour of a text that confirmed that rights catalogue without ambiguity. The moderate Islamic Ennahda party questioned some of these rights, triggering highly controversial debates on the question of religion and gender equality. The party had received 37% of the votes in the 2011 elections, far more than any other party. In our view a large part of the voters could not be dismissed. The right to vote is a human right as well. While making comparative international experience available, we thought it was most important for a democratic process that Tunisians resolved disagreements on the constitution through genuine consultations and negotiations. And so they did. While the text adopted could be improved in some areas, it contains significant democratic guarantees. All parties, Ennahda included, conceded many points, leading us to consider both the process and the result a success. The major challenge now lies in implementing the new constitution. The majority in the next parliament will have to further shape the new Tunisia, cleaning up laws to remove Ben Ali’s legacy and undergirding the new constitution with democratic legislation. The consensus logic of the 2/3 majority will not apply anymore in a normal parliament. Indeed the purpose of majorities is to implement their political programme. The risk will be that some ambiguities in the constitutional text could create temptations to undo the essence of the agreed compromise through legislation, judicial action or administrative measures. Both ends of the political spectrum may be tempted: Islamists to impose religious rules, their opponents, encouraged by the Egyptian example, to exploit ambiguities in the system of government to re-concentrate power in a repressive security state. Such a course of action would not be easy as the constitution provides for checks and balances. A Constitutional Court will be established along with independent institutions and guaranteed rights for the opposition. By placing executive powers in the hands of both a President and Prime Minister, Tunisia has departed from the model of a domineering presidency. Nevertheless, political institutions and legal texts alone do not insure against backsliding. The new democratic institutions can only come to life if they are backed by a critical mass of democrats. The biggest risk is that Tunisia’s politicians consider the past constitution-making as a painful, one-off exercise in negotiation and compromise, imposed by voting rule technicalities, rather than taking pride in setting a precedent for the country’s democratic culture. By engaging in the art of compromise, Tunisians made a powerful statement that should reverberate across the region. After the assembly voted with an overwhelming majority for the new constitution last Sunday, the deputies broke out in cheers and sung the national anthem. We hope that this sense of unity defines the spirit of the new Tunisia and that others will be inspired in building a new democratic order, as they were inspired by the Tunisian lead three years ago, when they dismantled the old order.